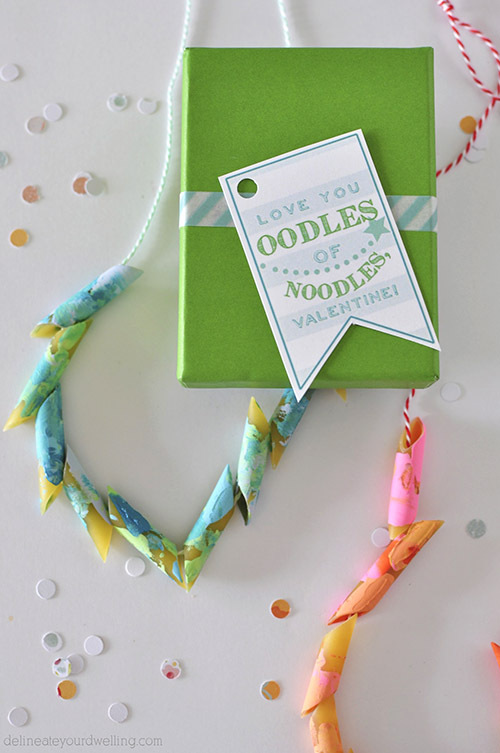 I love this sweet little Valentine printable paired with the cutest noodle necklace. We have fun at our house planning the perfect Valentines. If you are looking for loads of ideas before to check out these amazing Valentines. I have teamed up with some of the most creative bloggers to share the cutest Valentines imaginable. Each day you will be amazed with their cleverness! Don’t miss a day! Hope to see you tomorrow. Hello, Skip to My Lou readers! It’s Amy from Delineate Your Dwelling, a creative DIY blog. I am so excited to be here today starting off Cindy’s Valentine’s Day printable series. 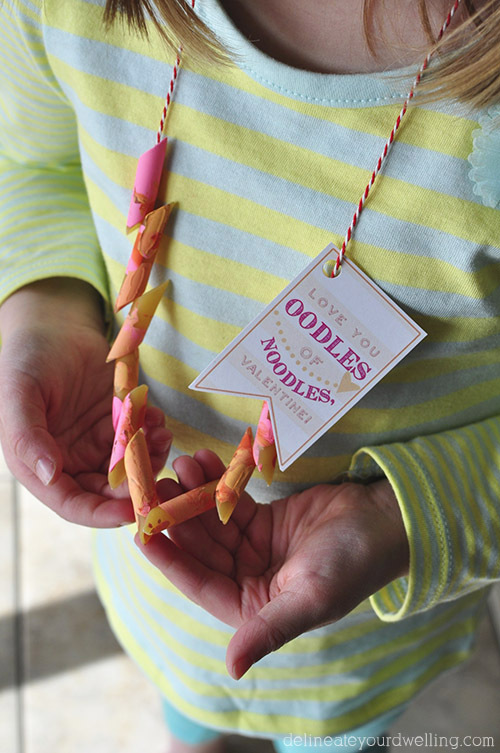 I am sharing a simple DIY craft you can do with your kiddos and a free Valentine Printable, Love You Oodles of Noodles to go with it. Be sure to cover your table with paper or a cloth, as this can be a messy activity. 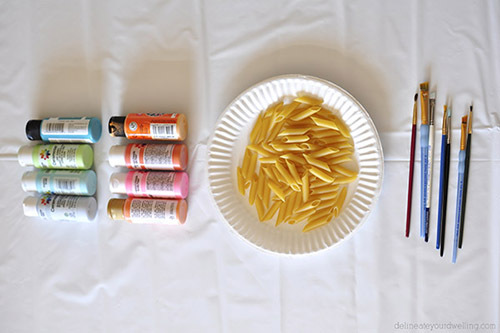 First, set out noodles and let your kids go wild painting them! I wanted two different color schemes, so I set out a plate of paints in pinks, reds and oranges and then after all those noodles were painted, I set them aside. And then got out a plate of blues and greens. 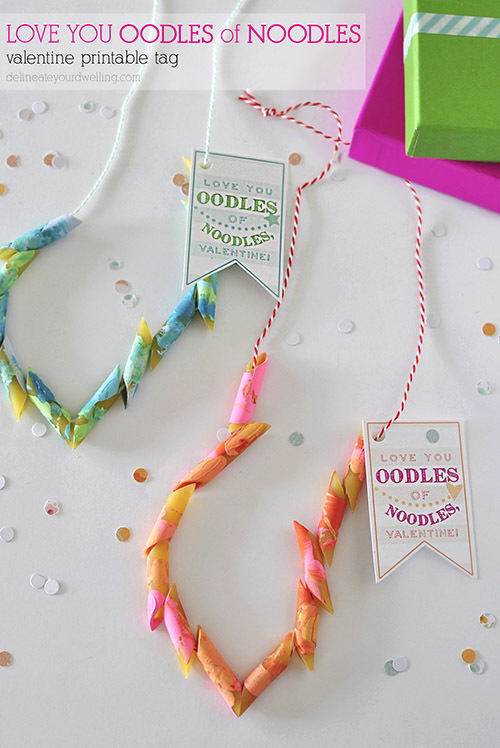 I love the marbled texture of the painted noodles! 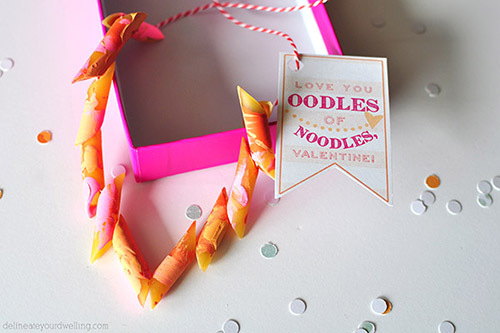 Now you need a fun tag to make your noodle necklace the best Valentine ever! Download the tag, print in color on white cardstock. 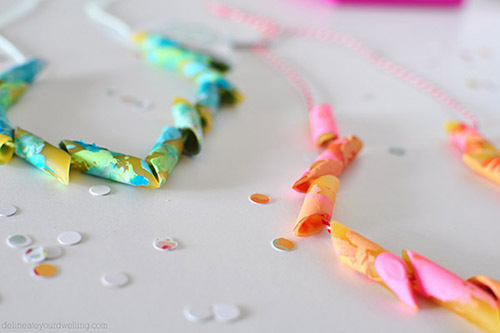 Cut out tag, punch a hole at the top and slip onto the noodle necklace. 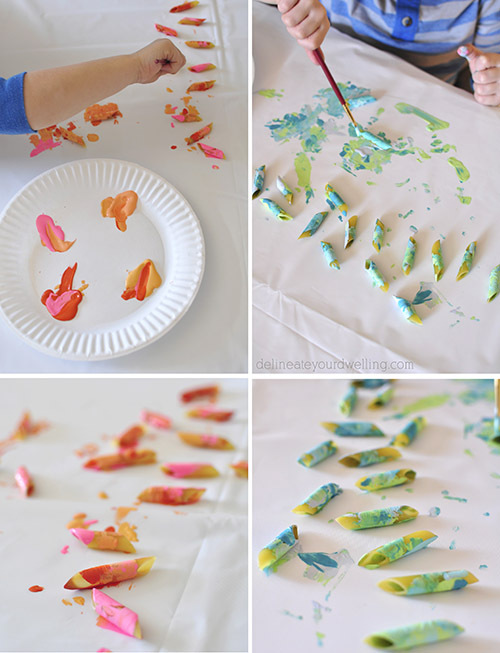 These are a simple Valentine’s Day craft that you can have your children’s help with and they can be worn long after Valentine’s Day, too! My kids have been wearing them every day since we made them. If you enjoyed this Valentine’s Day printable, you might like a few of my other Valentine’s Day projects. I created a heart shaped Valentine’s Day wreath, a Leather Cuffed Glass for upcoming love themed parties and a Cookie Dish! Hello, I’m Amy! Delineate Your Dwelling a place where I share creative DIY projects from my home. You can see more of Delineate Your Dwelling on Pinterest | Instagram | Facebook | Twitter.